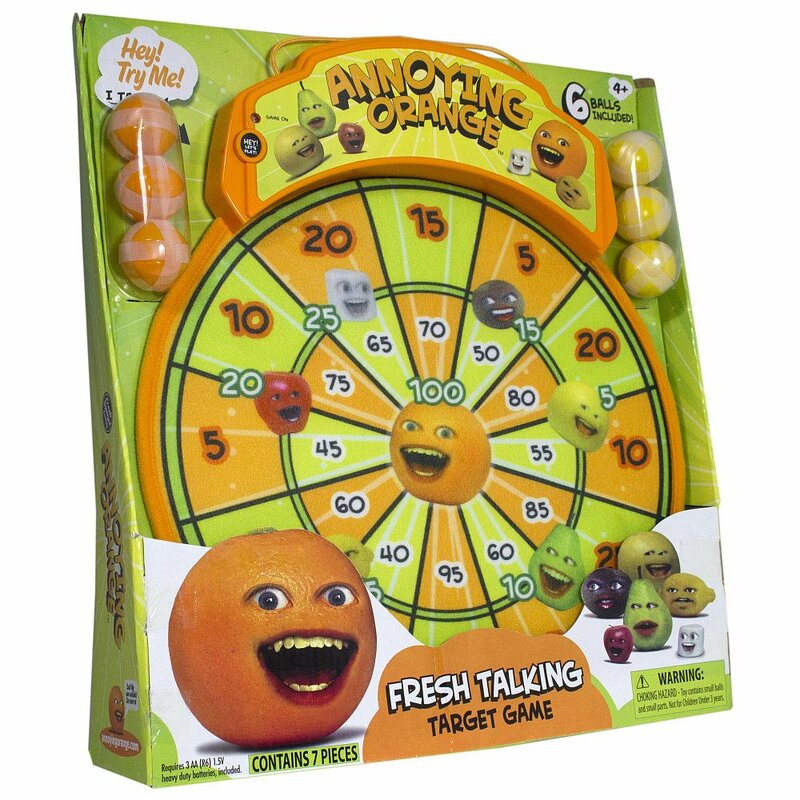 Take aim at an annoying target with the Annoying Orange Fresh Talking Target Game. You can easily hang the board in any desired location…and let the playing begin! Annoying Orange and the Kitchen Crew challenge players with funny jokes and heckles like, “Hey! Hey Player! Do you have grease on your hands? !” This set includes six balls for endless play (and great for multiple players). Requires 3 AA batteries (included). Safe to play; easy to hang. My husband grew up in a house with a dart player so from a young age he’s played darts and enjoys it he has a dart board hanging in his cave and loves to toss darts to just relax and blow off some steam. Well our daughter being the ever nosey newsbag she is loves to do anything her daddy does but daddy doesn’t really trust our not so coordinated daughter with something sharp and pointy that can and probably will hurt something or someone. She wants to be included and he wants to include her but she’s still too young but we’ve found a solution. 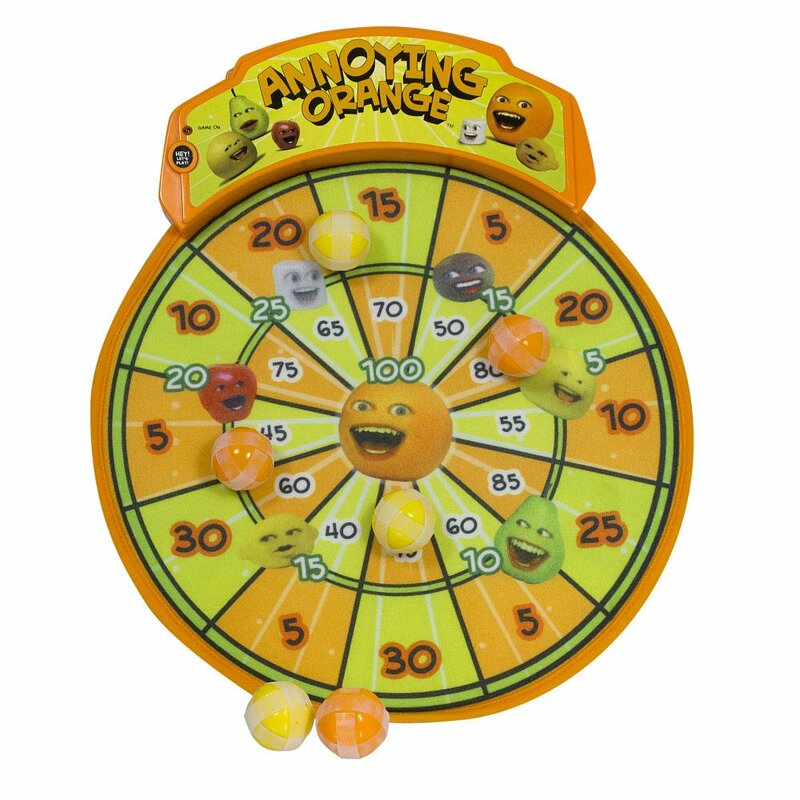 The Annoying Orange Fresh Talking Target Game it gives our daughter a chance to work on her hand eye coordination, spend time with her daddy and play a game featuring a character she loves. Set up is simple and you only need 3 AAA batteries to have the Orange and his friends heckle you during the game. There are no sharp pointy objects in this game Velcro balls are your darts and you just simply toss them at the board. Very safe, very simple and very fun, we’re all having a blast playing and laughing at the jokes and just how bad some of us (me) are at dart type games. Even though I’m not that good we still have a great time playing together and laughing and ultimately that’s all that matters. So if you know a kid that loves the Annoying Orange (and right now what kid doesn't) make sure to pick up this great game for that special someone on your holiday gift list this year, they will love it! Susan S. Disclosure: The reviews and or opinions on this blog are my own opinions . I received a dart game to review. No monitory compensation was received. I was not required to write a positive review. Your experience may differ. The opinions I have expressed are my own I am disclosing this in accordance with the Federal Trade Commissions 16 CFR Part 255: Guides Concerning the Use of Endorsement and Testimonials in Advertising .